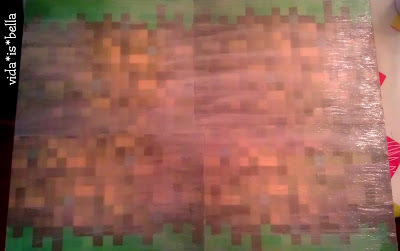 We started with a pixelated backdrop by cutting 3 inch squares of scrapbook paper in shades of brown, green, blue and white and then gluing them to a science fair board with rubber cement. 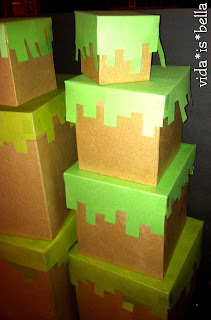 We bought a set of nesting boxes at Michael's and cut green paper to look like pixelated grass to cover the lids. 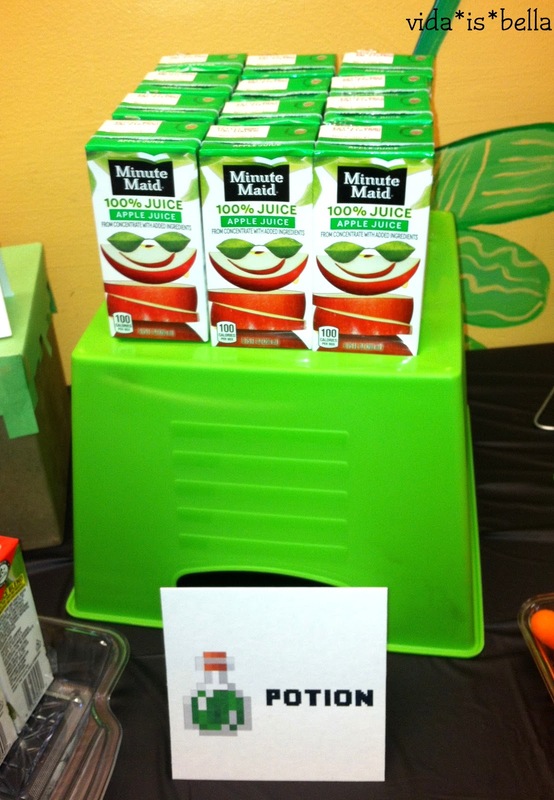 These were perfect for adding dimension to our table. We made labels for the different items to connect them to the game and also put a picture of the corresponding game item. 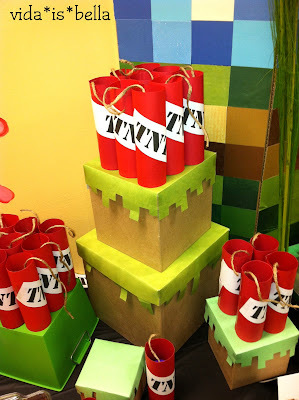 One of the favors was bubbles which we wrapped with paper to make TNT. 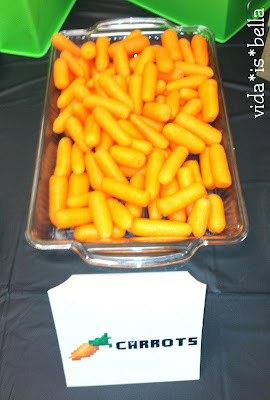 The easiest item on the table, carrots! These cookies were a big hit. We picked up some square (ish) trays at the dollar tree to avoid anything round on the table and used them to display different things, including these creeper keychain favors. And of course we have to talk about the fabulous cake Lety made! 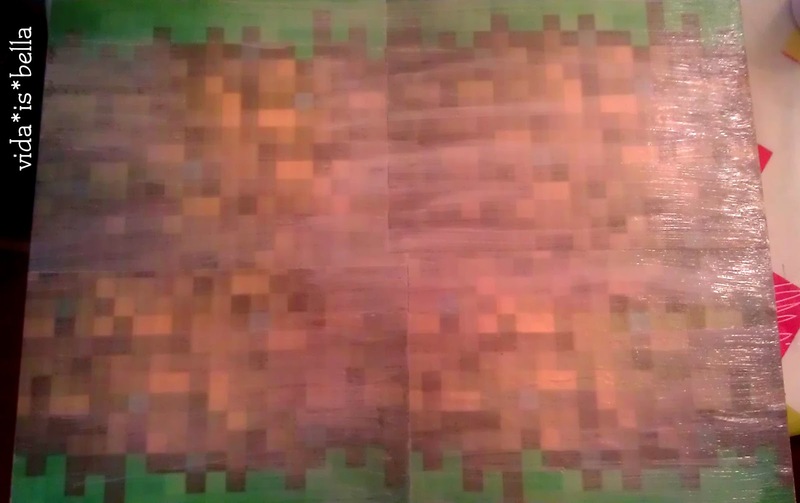 The cake board was made by enlarging pixelated images from the game, printing them out, and mod-podging them onto the board. The edges were finished with a matching ribbon. 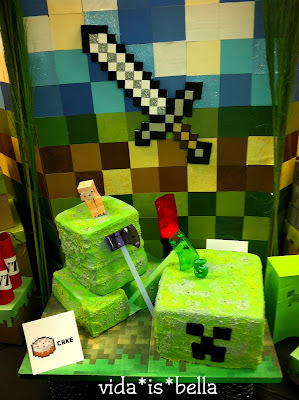 The top layer of the cake was a bit wobbly so we ended up putting it next to the body, as if the birthday boy cut the head off the creeper, which he loved. The awesome sword we stuck to the backdrop was the example craft that all the kids made. See how to make it here. And if you want to know how to make the birthday banner in the next pic, check it out here. Where did you get the food clip art? 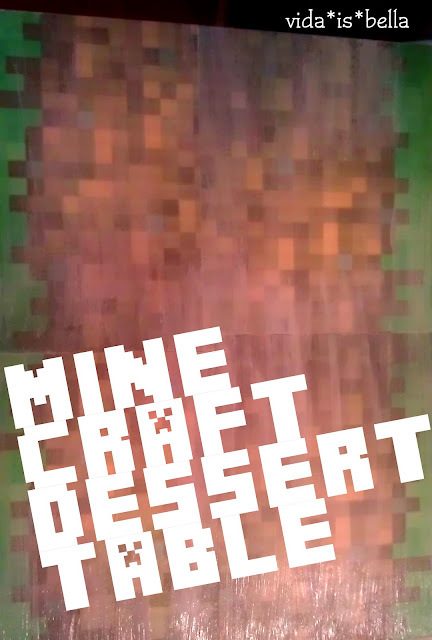 I have the minecraft font but can't find anything that will allow me to have the food pics too. We used PhotoShop to change the color of one of them. How did you do the happy birthday banner and swords? Good question! 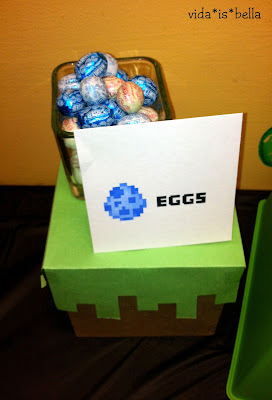 We forgot to link to those tutorials, so we will be adding that to the blog post. For now, here is the link to the banner: http://vidaisbella.blogspot.com/2013/03/minecraft-b-day-banner.html and here's for the sword: http://vidaisbella.blogspot.com/2013/03/minecraft-sword-project.html. 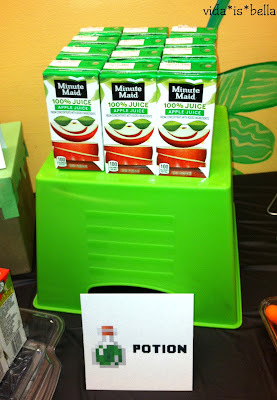 Let us know if you have any other questions and thanks for viewing our blog!